In the late morning, dizzy from heat, I survey the far side of a large lagoon. Bracketed with the dense foliage of knobthorns, leadwoods, rain trees and fever berries, this remnant left behind by the Okavango is ultramarine, inviting. But the color is only an illusion, a reflection of the blowsy blue sky. The water is actually steeped brown, rich with dung, dead snails, rotten vegetation, sediments, and decomposing bodies by the thousands: fish, spiders, ants, beetles – any creature unable to outrun last year’s flood. Not far from here jungles of papyrus lean their feathery seed heads over the clear blue channels of the Okavango, tall stands that line the permanent footprint of the Delta. The river is inching southward, breaking the boundary between water and desert. Soon it will flush this lagoon, scouring out the sweet muck at its bottom to spread among grassy floodplains, and the desert will green. With the river will come crocodiles and hippos and other denizens of its deep, running water. Standing shoulder-to-shoulder on mats of trampled reeds, the elephants blow a concert of bubbles, bassoons under water. They shower their spines, poke their trunks into the back of their throats and release gallons of water at a time. 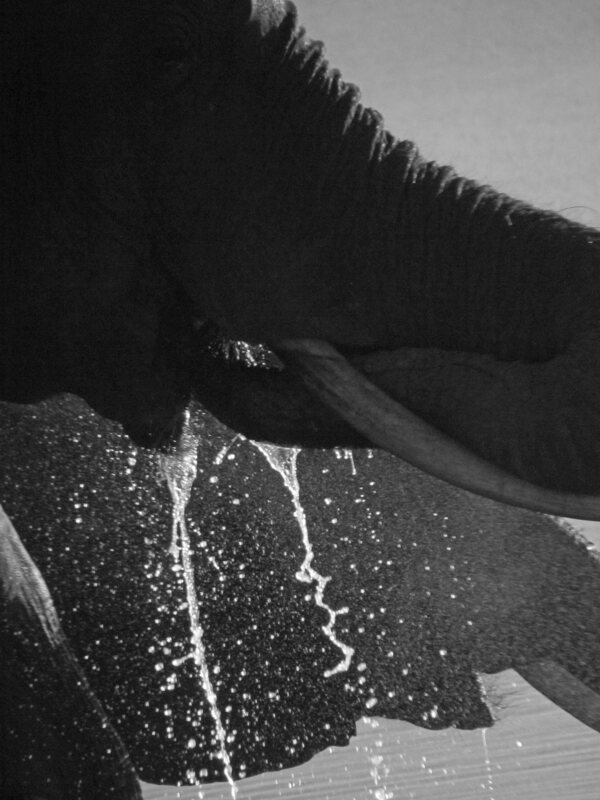 As they remove their trunks some water spills from their mouths. An odd mossy smell rises. My mind wanders, wondering what it would be like to follow quicksilver fingers of water season after season, migration bred into my bones. When the river reaches this part of the Delta, a new population of birds will arrive: Wattled cranes, Egyptian geese, Reed cormorants, Darters, Avocets, Black crakes, Red-knobbed coots, Southern pochards, Sacred ibis, Hamerkops and Saddle-billed storks. 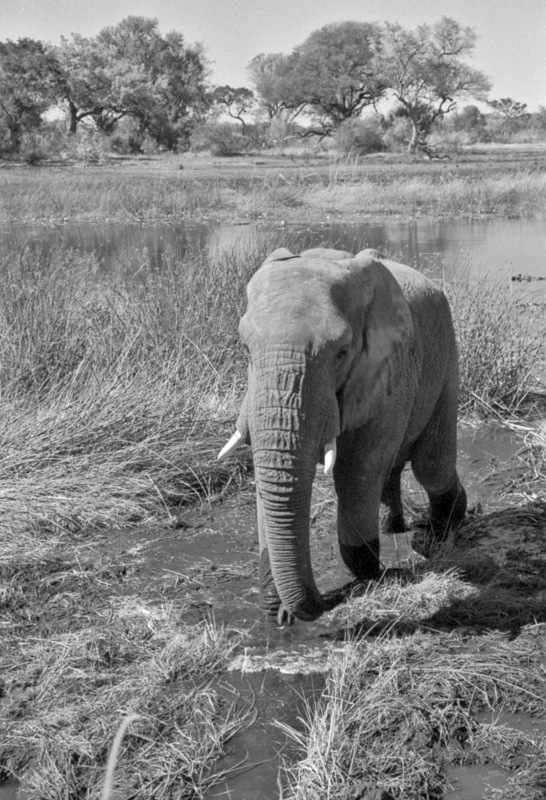 Jabu sloshes up the embankment and heads for his ration of fresh alfalfa spread under nearby trees. His feet and ankles are covered with mud. He looks like he’s wearing socks. His trunk is relaxed and curled slightly, to keep the tip of it out of the mud. Although this is just a backwater of the Okavango, huge trees line the shore behind him. No wonder elephants grew large in Africa: there was enough room and food to do so. I slap dust from my pants and follow, as eager as he is to tuck into lunch. I watch him stash a chunk of alfalfa between his tusk and the upper lip of his trunk, pick off mouthful after mouthful as if eating peanuts from a bag. He smacks his lips as he eats. When the grass is gone he drapes his trunk over his left tusk. His eyes close and he dozes. 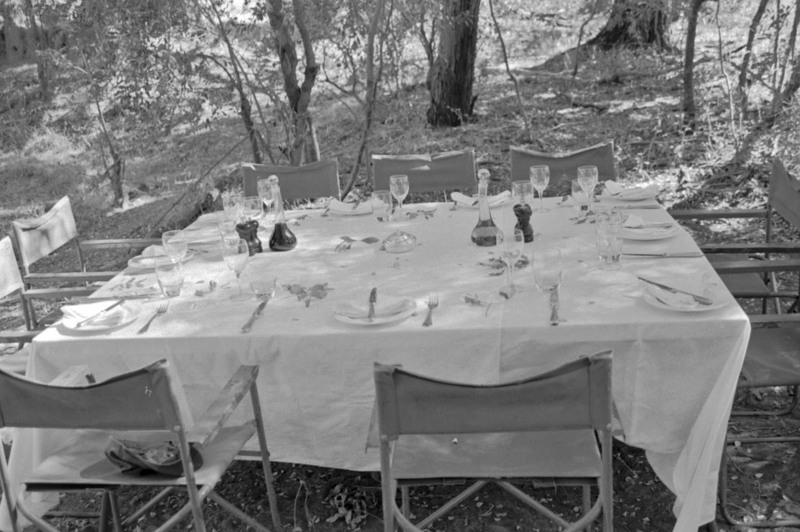 In a shady grove near the lagoon a table covered with a white linen cloth dazzles the tourists. Fresh branches of mopane decorate the surface of the table; the leaves on each branch fold modestly like small olive table linens. Knives rest across linen napkins on white china bread plates. Pepper grinders, water glasses, oil & vinegar decanters and wineglasses complete the illusion that we’ve stumbled into the al fresco dining room of an elegant restaurant. Nodding at murmured compliments, the staff from Stanley’s hand out cold beer, which has been uppermost on many minds. They’ve set up a buffet complete with chafing dishes. White lace doilies edged with heavy colored beads protect the salads from flies. It’s odd how fast we re-civilize. All morning long the tourists had been mostly silent, filled with awe at walking next to elephants. Now they sprawl in camp chairs and compare camera lenses. A cake of soap sits in the fork of a bush next to a white basin on a folding wooden stand. I use the murky water in the basin to lather my hands. One of the camp staff holds a pitcher of clean water for rinsing. The water in the basin turns even grayer with dirt. I empty the basin and small puffs of dust rise from the force of the water hitting floury sand. Then I too re-civilize, join the human conversation. What an amazing contrast. I am fascinated that the tour provides this elegant dining experience. I’m sure I would be more than content to gnaw on some hard bread and might even resent leaving the raw intimacy with nature that you describe. But then I won’t judge and will wait to read the book to discover how reassuring it might be to wash and handle silver afterwards. Sometimes tourists get so awestruck that the set down their cameras in the grass and forget that they even had a camera. That was one of my jobs – picking up after tourists: “Ummm, excuse me, but I think you left this back there . . .” It’s funny, though, when you see a fork, you absolutely know what to do with it! I can relate to forgetting my camera during a moment of awe, or hilarity – always kicking myself in the pants afterwards.